I actually saw two movies on Thursday prior to departing for a camping trip. As usual, I have squandered my chance at a timely review of a new release movie. This happens with such reliability that this can probably never be my actual job? No, I’m kidding, there are much better reasons for that outcome than lack of timeliness. Still, though, I’m here now, so let’s talk. Ghostbusters, right? There’s been a lot of chatter for months about this movie, mostly along feminist lines. On one side of the divide are people complaining about an all female cast of main characters taking over the reins of a major nostalgia franchise. On the other side are people who want to slap the smirk off the first group of people, because, Jesus, how is this a thing someone can justify complaining about in 2016? (I, uh, may have an opinion in this race.) For my part, my complaint from the start has been, why is this a reboot? Why not a next generation sequel? This complaint, while I have not really let it go after the fact, was never enough to keep me out of the theater. Anyway, though, the outcome? I’m gonna stay away from plot, because you know what’s up. 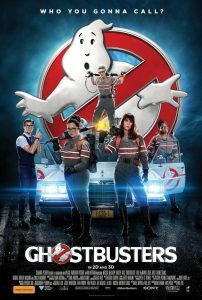 Four women in New York with unlicensed nuclear reactors strapped to their backs are out to solve a ghost problem. Anything less would be impossible for you to know, and anything more is best saved for the theater. But was it worth it? I have mixed feelings. See, on the one hand, they drew so very heavily from the nostalgia well. Yes, I loved the movie unabashedly, but it’s not really easy to tell if I’ve been puppeted into feeling that way. On the other hand, and I think this is key: every moment that I walked out of the theater laughing about and already quoting back and forth with my friends was a moment that was new and fresh to the new characters. I hope it passes the test of time, and I hope any potential sequel is neither a pale facsimile of this one nor a tired retread of a plot that already exists. Because I really want to see it again already. I know for a fact there are jokes and sight gags I missed; and more importantly, I want to get some of those lines down solid, because I wouldn’t be surprised to be throwing them around in casual conversation 30 years from now, just like I do with the old lines today. This entry was posted in Film and tagged Alamo Drafthouse, comedy, sci-fi on July 18, 2016 by Chris.